I love this home! It doesn’t look like much from the outside but this single wide mobile home interior is beautiful and modern. It was listed for sale in 2008 on a blog called Nelson Mobile Home. The price was $43,900 and it has 2 bedrooms and is a 12×60 with a total of 725 square feet. The location is Nelson, BC and it sits in an adult only community. Related: Two Gorgeous Canadian Mobile Homes. Canadians have some serious talent when it comes to their manufactured homes! Every mobile home I’ve seen in that country has been fantastic! This one is no different. There are no photos of the home before the makeover but we all know what a typical single wide looks like. I’d guess this to be mid to late 1970’s model. The color is bold and perfect for a small space. New windows and flooring give the home a modern and clean feel. The choice to not use crown molding is interesting, but I think crown molding would’ve taken away from the clean lines. The base trim is really all the room needs to give it a complete look. Massively upgraded mobile home just minutes from the beach and downtown Nelson in a quiet, adult park. Ready to move in condition: completely new tiled bathroom, new hardwood laminate flooring, energy-efficient windows, modern trim, and drywall. The 12×60 trailer has an open, remodeled kitchen and private yard. New engineered trusses and roof installed for easy snow management. A must see! The kitchen is just as a great as the living room. 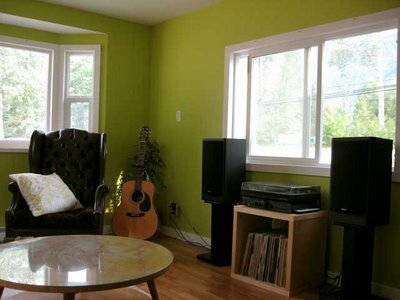 This whole home could be in an IKEA catalog. Everything about it appeals to me! Mind you, this is from 2008 and this contemporary/modern style is more popular than ever. 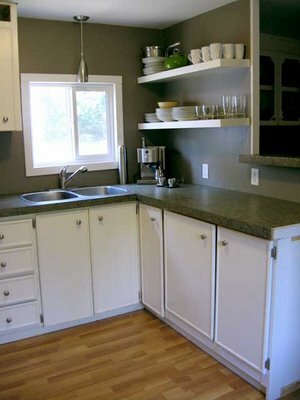 The floating shelving, pendant lighting, grey walls, and white cabinets are gorgeous! Even the pulls and handles are perfect choices. Whoever designed this has some talent! 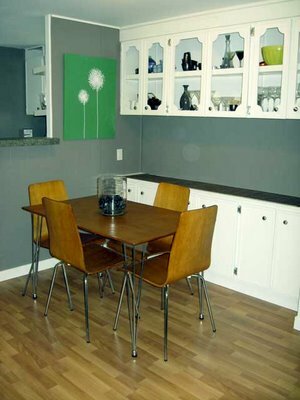 Built-in cabinetry is usually the first thing removed in a manufactured home remodel. Not this time! I applaud the person that chose to keep it, too! This makes a gorgeous display area and is perfect for large dinners. 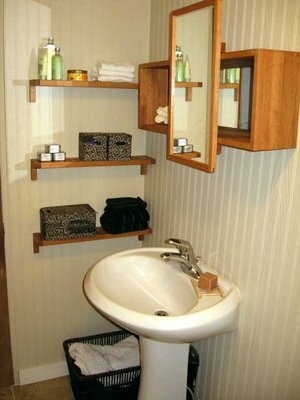 The bathroom keeps the modern look of clean lines and simple decor. 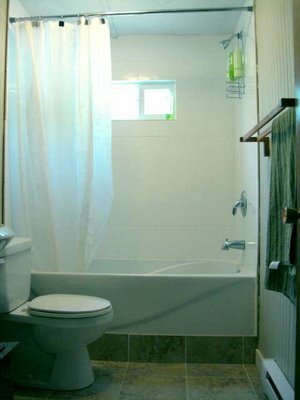 Looks like tile flooring was used and they went with a unique tile wrap for the tub riser. I love it! Having a tub on a riser or platform makes it easier to get in and out of and keeps water away from the cracks and crannies perfectly. The use of bead boarding is a great idea as well. One thing to keep in mind though, bead boarding is made in both waterproof and non-waterproof options. Make sure you spend the extra money to get the waterproof kind if you’re using it in a bathroom or kitchen. I stumbled upon this blog/home purely by accident (I love it when that happens). The blog has nothing else on it other than this listing so I didn’t even try to contact the owners. If you happen to know anything about this home or the new owners, please contact me. I love this bold home and it is just my style. What do you think about it? Love the simple design and color. For those of us who remember, it’s a little throwback to the 50s. The coffee table, no crown moldings, simple windows. and color, especially give it that youthful feel of the new tract homes which were all over So. Cal in the early 50s. I’ve been trying to pick up some ideas for my new endeavor and this is now my fave. Thanks for showing it. I especially like their use of open shelving in the kitchen and bathroom! mobile homes are also called as transportable home. the people who love adventures and move one place to another, mobile homes are best options. 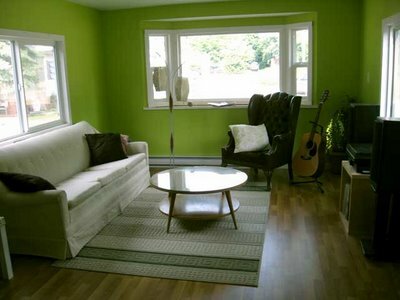 many builders in Canada sell ready made homes with best interior. these homes are affordable.